Thanks so much for your kind comments about my upholstered headboard yesterday! In case you missed the reveal post, you can see it here. Today I'm getting into the nitty gritty details of how I put this whole thing together. DIY upholstered headboards are nothing new (there are more tutorials than most other things in the blogosphere, and so many ways to do this! 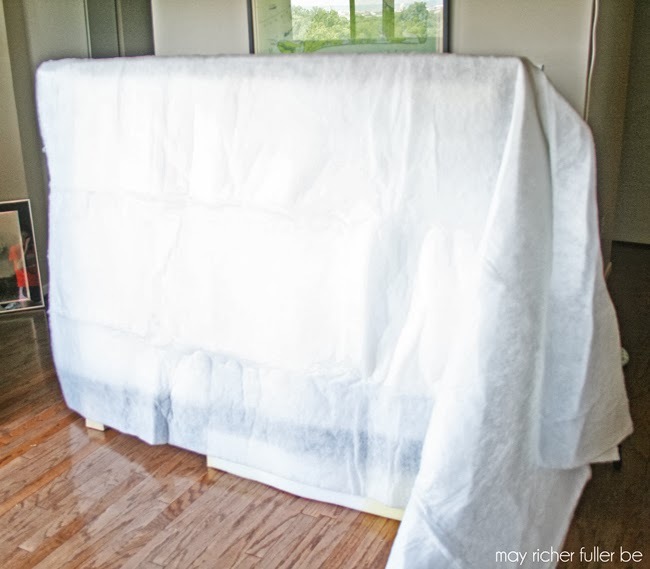 ), but I'm hoping this post will be helpful for those of you whose goal is to make a simple, professional-looking, budget-friendly headboard without a set of power tools on hand. You with me on that? That means if you have a set of hands, a few basic tools, and access to a Lowe's/Home Depot, you can do this. First off, let's talk about what supplies you'll need. This is for a QUEEN size headboard, so if yours is larger/smaller, please adjust accordingly :). 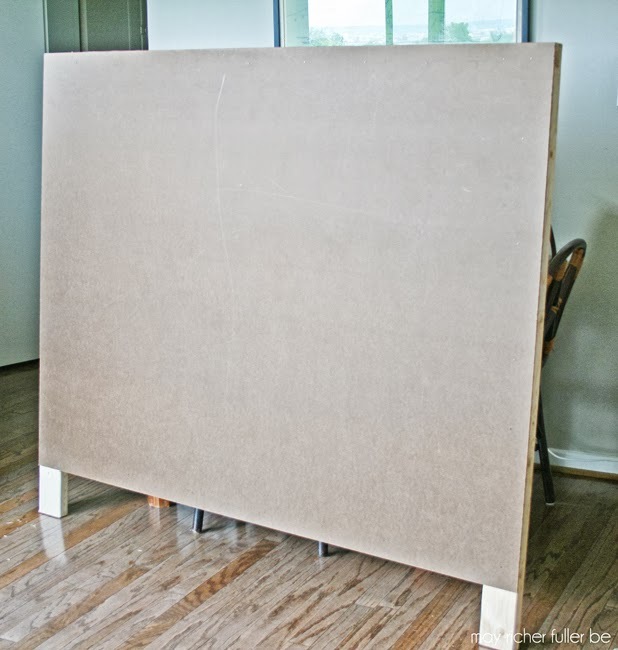 One 3/16" 48"x96" (4'x8') brown hardboard wall panel cut down to 48"x62"
Step 1: Go to Lowe's/Home Depot to pick up your wood (and other supplies if you don't have them on hand) and have them make your cuts for you. Step 2: Haul your supplies home and set up your work space. Step 3: Assemble the frame for the headboard. 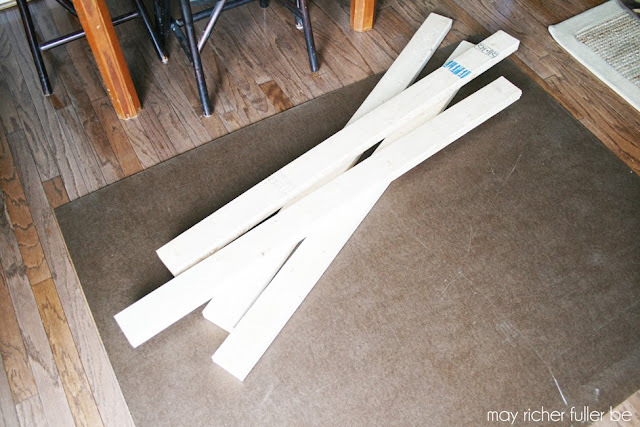 Place your 2x4s under each of the four edges of the hardboard. They should form a rectangular frame. Two of the 2x4s will stick out 6" from the 48" length of hardboard. Those will be the legs of the headboard. 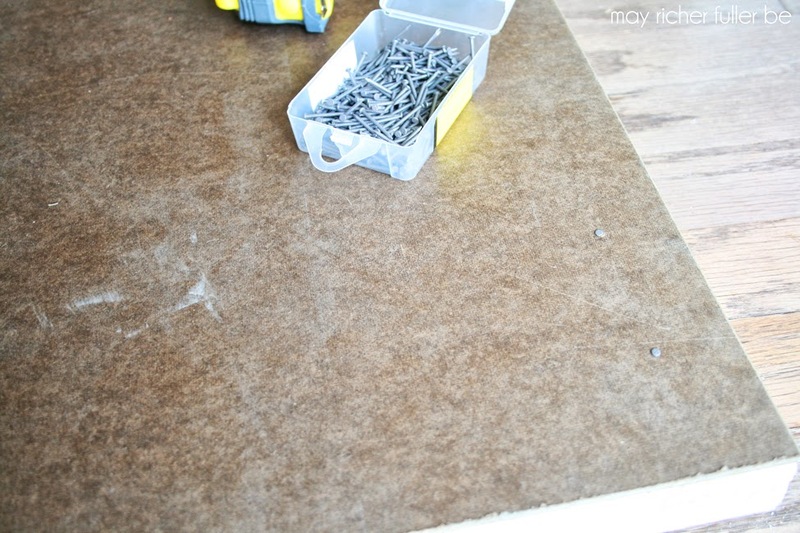 Make sure the edges of the 2x4s are flush with the edges of the hardboard. The hardboard must be on top of the 2x4s so that you can nail it to the 2x4s. Step 4: Nail the hardboard to the 2x4s using 1" panel nails every 4-6 inches. The nailheads are pretty tiny, so look closely at the bottom right corner to see them. I'd suggest putting one in each end of the 2x4 first so that your boards won't move once you start hammering away. This will ensure that the 2x4 stays flush with the hardboard edge. 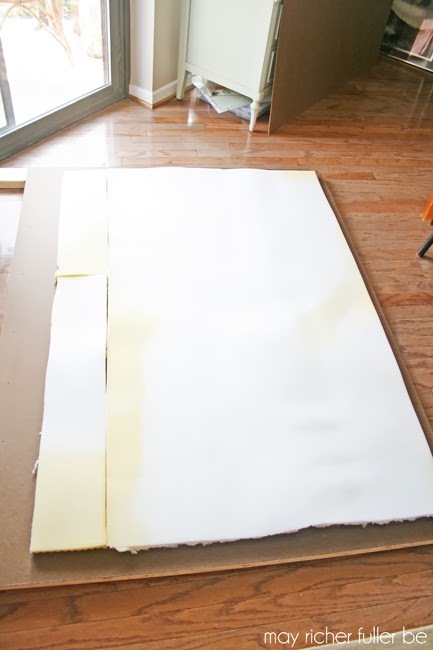 Step 5: Cut the foam mattress topper to fit the width and height of the hardboard and attach it to the frame. That means I cut my foam 58" wide. Use a serrated kitchen knife for this. 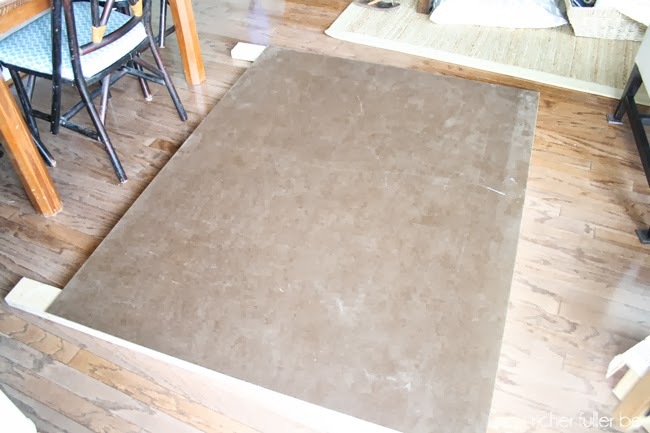 I then divided the remaining piece of foam in half in order to cover the majority of the rest of the hardboard. It doesn't have to reach the bottom completely because you don't see that part once it's behind the bed. I used painter's tape to attach the foam to the frame. It doesn't stick super well, but it got the job done until I could complete the next step - wrapping the frame in batting. 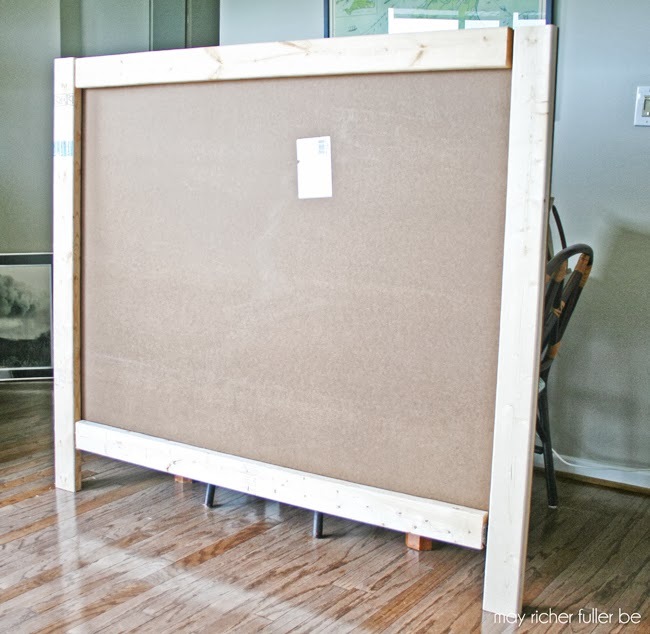 Step 6: Wrap frame in two layers of batting and secure it to the 2x4s on the backside using a staple gun. 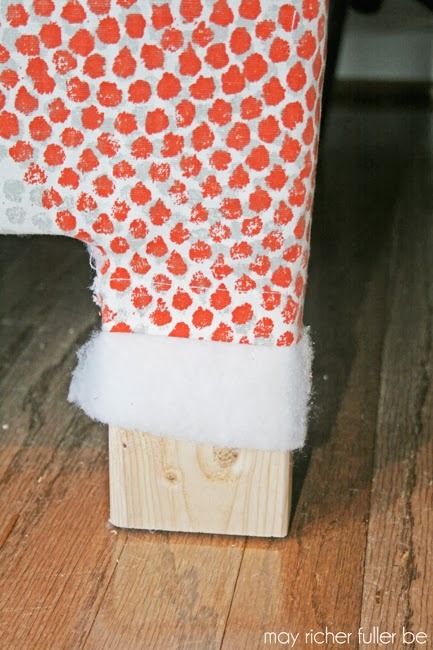 For this step, I found it to be easiest to have the headboard upright (lean it against a secure surface like a table) so I could pull the batting tight and staple it easily. Since I bought 110"x110" batting, I just unrolled/unfolded it until it was down to two layers, laid it on the frame and trimmed the excess. I didn't worry too much about this being centered or straight - just eyeballed it. Looks a little ghost like, huh? When you're stapling the batting to the frame, my suggestion is to put one staple in the center of each side first, making sure the batting is taut, but not too tight. You don't want it pulling. Then make your way around each edge, pulling taut and stapling as you go. The goal here to to provide a smooth surface for your fabric to lay on eventually. For the corners, pretend like you're wrapping the ends of a present. Fold one edge in, then fold the other one in on top of it and put a couple of staples in it. It's not super easy to see on the thick batting, so if you want more details on that, take a look at the way I upholstered my desk's top in this post. Step 7: Iron fabric (if necessary) and line it up on top of the frame. 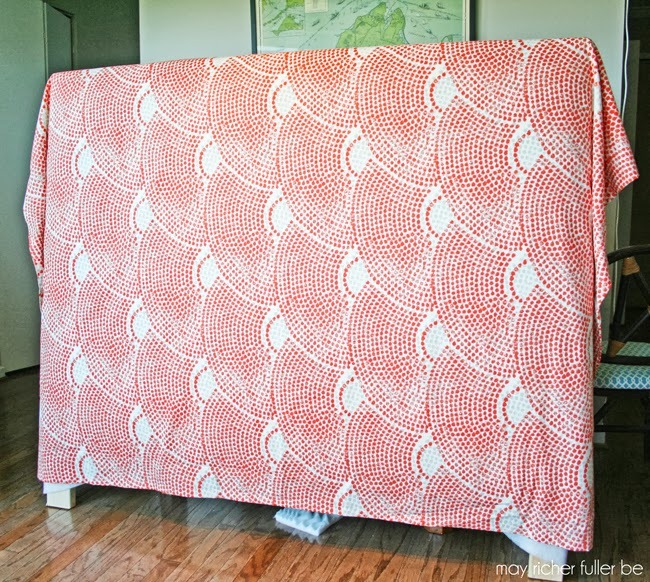 I chose to use this curtain panel since it was the perfect amount of fabric (just over two yards), inexpensive and I loved the pattern. 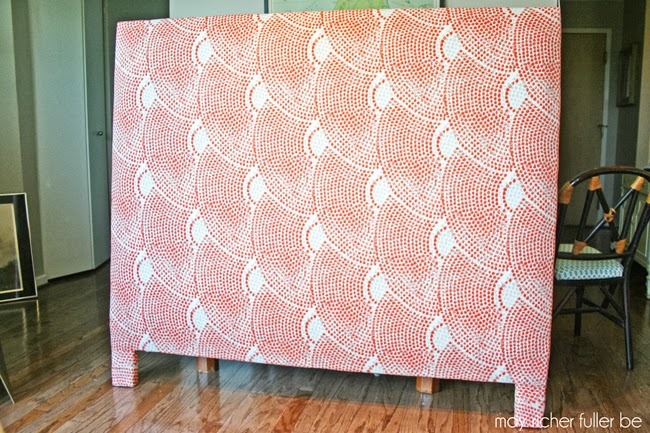 It's the Threshold Shell Print Window Panel in coral. It provided the perfect pop of color and fun design I was going for in the bedroom. Getting your fabric lined up (straight and centered) is one of the main keys to making your headboard look professionally done. This step can be tricky depending on the type of fabric you choose. This pattern was fairly easy to center and make straight because it has a pretty regular repeat to it. 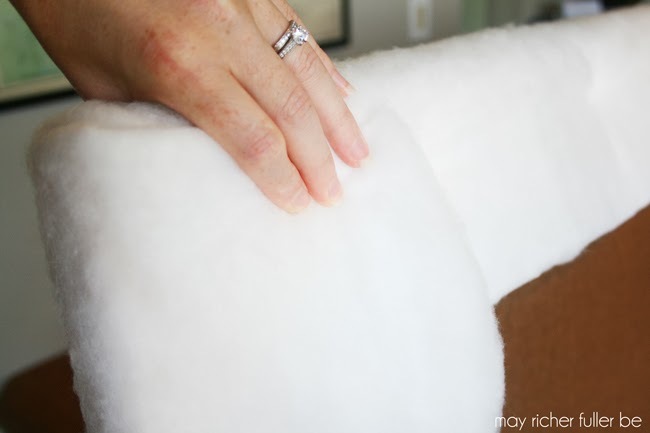 If your fabric is a solid color, you don't even need to worry about getting it just right. Having an extra set of eyes is helpful here. I had C help me make sure it looked right. Step 8: Staple the fabric to the 2x4s on the backside of the frame (yep, right on top of the batting). Again, I put one staple in the center of each side, making sure it was taut. Before I stapled the whole thing though, I took a look at it from the front and made sure it looked right. Since it did, I kept going. If it didn't, this was the time to make adjustments! Then I staple, staple, stapled all the way around...and trimmed the excess. I saved that excess for the last step to finish off the legs! I finished the to two corners the same way I did the batting, making sure they looked the same on both sides (again, a step to keep it looking professional!). Step 9: Finish off the legs and bottom corners with a little magic. Ok, so it's not magic, just a little finessing to make sure the bottom looks just as good as the top by the time it's all done. Take a look at this photo below. You'll notice that the fabric kind of wraps its way from the bottom of the hardboard slightly down the leg. 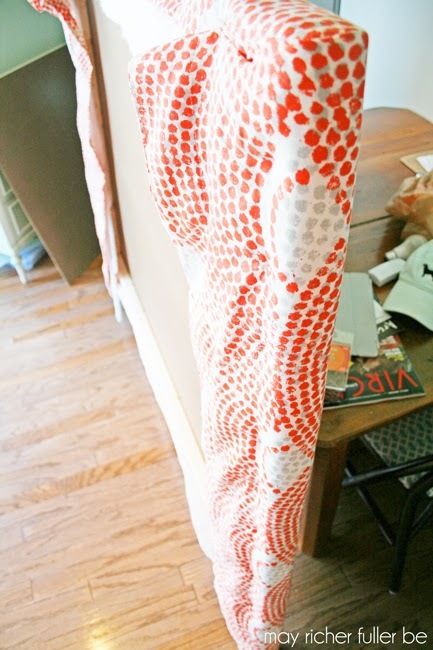 I did this by snipping the extra over-hanging bottom fabric diagonally from bottom to top, toward the leg. I ended up with two triangular pieces of fabric. I stapled one to the bottom of the headboard, and wrapped the other one around the leg and stapled it into place. Does all of that make sense? I know it sounds a little tricky. It looks a bit messy at this point, but don't worry, we're about to work some magic to make it look all nice and finished :). To finish off the leg, I took a piece of the excess fabric I trimmed off of the edges and cut a piece that fit around the diameter of the leg and is 6" tall (the height of the leg). I wrapped that piece around the leg and stapled it tightly to the backside. Once the legs were finished, that was it! Headboard. Done. I definitely gave myself a little pat on the back. And maybe did a little dance...Take a look! Then it was time to put it in its new home in the bedroom. I borrowed C's strong set of arms and we placed it behind the head of the bed. We didn't bother securing it to the frame because it's wedged in there super tightly. If you wanted to do that though, you'd just have to drill some holes into the edges and secure it to the headboard with some long bolts. And here's how it looks against our bed! We are so pleased with it. I'm so happy with the way it turned out and it really only took me an afternoon to do it! If you want more photos, take a look at yesterday's post :). Now I just need to get something for above the bed (round mirror perhaps?). That pleated paper wreath is just a temporary placeholder. For those of you wondering, yes, I did end up taking that big beautiful painting down you saw in this post. There was just too much going on with the busy pattern of the fabric and the painting together. Y'all probably know by now that I'm pretty thrifty when it comes to projects, so I tried to spend as little as possible on this headboard without sacrificing quality. I wanted to do it right so this headboard would last us a good, long time. Not bad, huh? Especially when you compare it to buying new! What do you think? Any questions about what I did? Any of you planning to take on an upholstered headboard in the near future? *P.S. 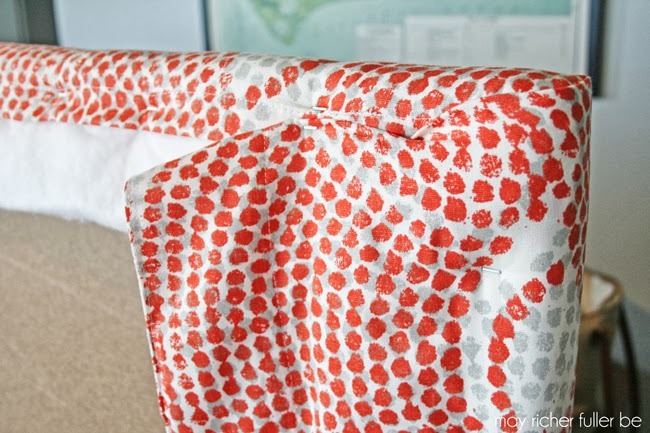 Want to see the EASIEST way ever to upholster a headboard? It's just like this one, but there's NO building involved! Read about my method here. *P.P.S. Need help creating a home you love? 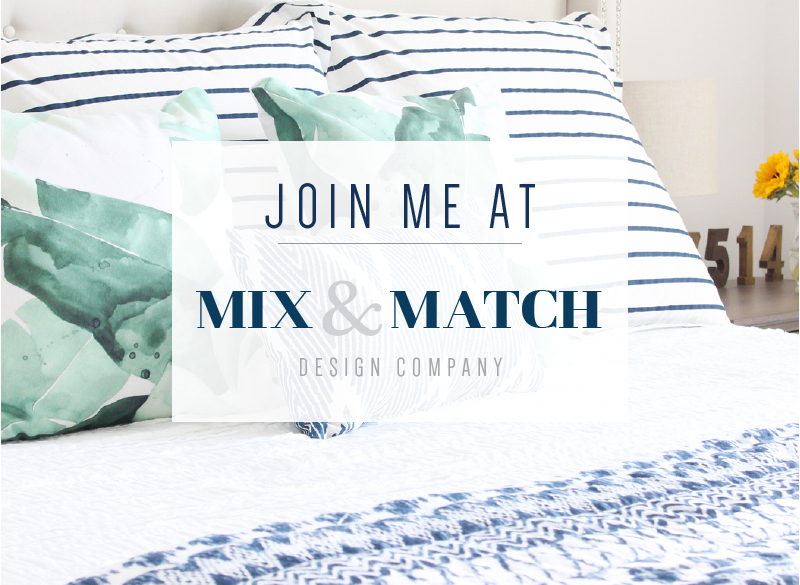 Take a look at my e-design service: Mix and Match Design Company! Just found your blog and glad I did! Great job on the headboard! This is so pretty! And relatively easy too! Love the fabric choice and great photos. Thanks for sharing at All Things Pretty. Pinning to my decor board. Found your blog on the Commona-my house blog and think you have a very nice tutorial here. 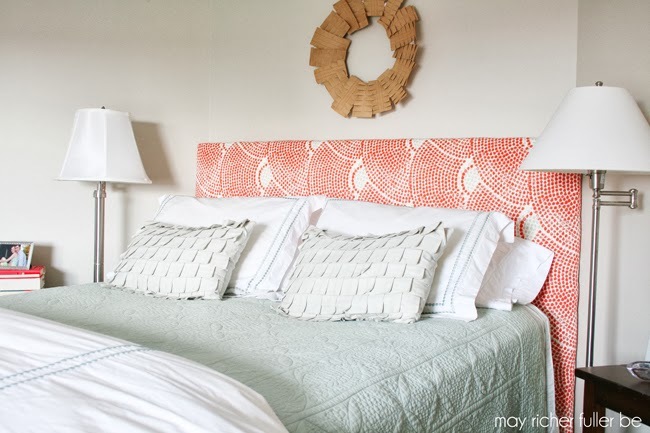 Your headboard redo is great. I so enjoy recycling items. I would love it if you would link up with us at my weekly Clever Chicks Blog Hop this week! Congratulations…this post was featured on Create It Thursday #13! Thanks so much for linking up such a great idea last week! Thanks Leslie!! I'm honored :). Headed over to see the other features now! Awesome post! I would love for you to share and link up at my weekly TGIF Link Party if you haven't already this week. Your favorite posts, most popular, recent or new! The party is open every Thursday night and closes Wednesday's at midnight. Followed by (Not SO) Wordless Wednesday! http://apeekintomyparadise.blogspot.com/. Looks great Chaney! Target has so many fun curtain patterns right now (fabric shower curtains too! 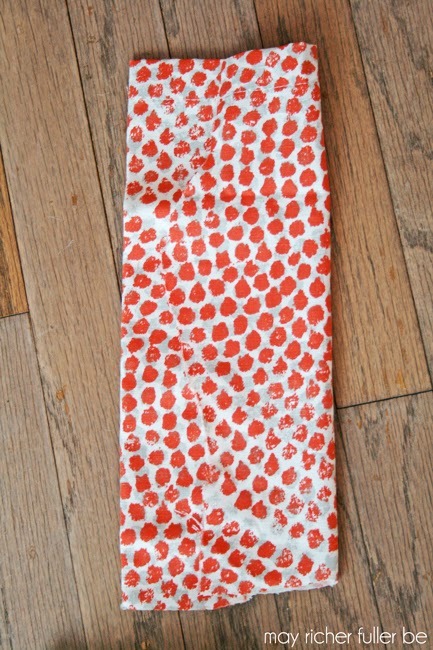 )and I have been dying to pick some up just to use the fabric! Wow! Your headboard looks great! I never would have thought to use a curtain panel! Great idea!! Love the head board and pretty color! Great job! 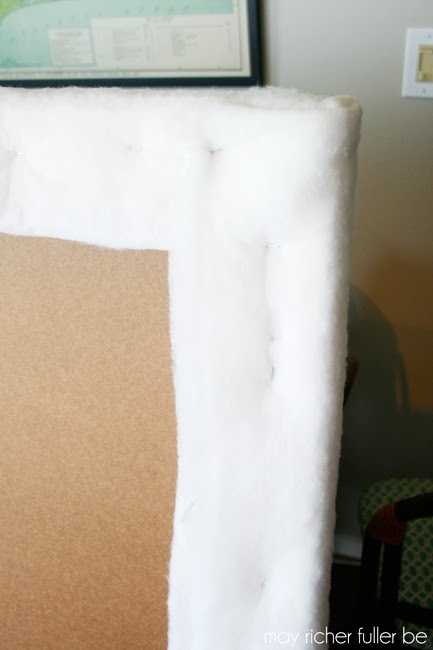 You may already know this, but if you want to make a padded headboard with tufting, you can use peg board instead of the hardboard and there are no holes to drill. 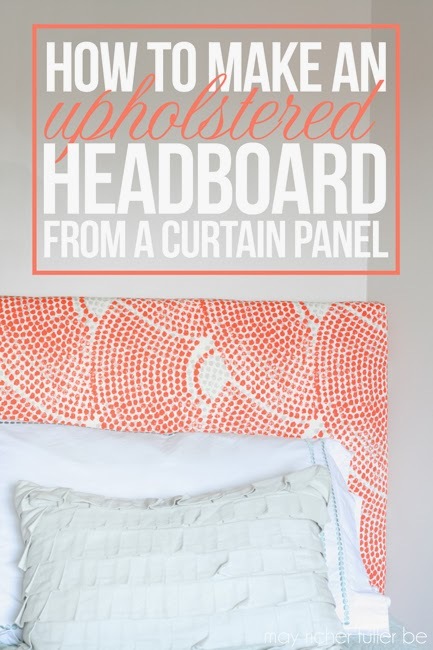 Great tutorial and beautiful headboard! Pinned! And I'm including a link back in this week's DIY highlights on Friday. 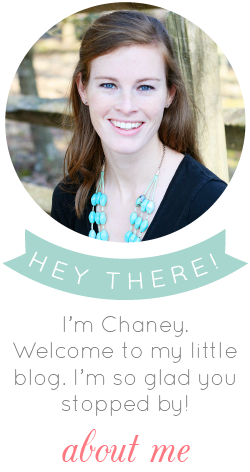 Thanks so much for sharing, Chaney! I am in the process of redoing my bedroom right now...I think I may totally do this!! What a great idea!! 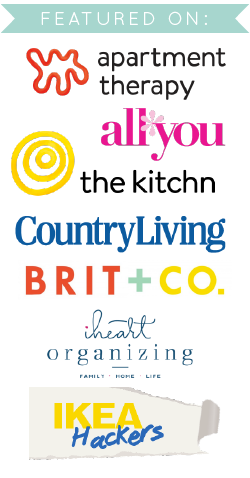 Thanks for sharing at my Weekend Beautiful Blog Party!! I think HD carries a foam camping mattress that's really inexpensive, too. I have seen other bloggers use that for projects like this. Love the fabric! Aww, thanks so much!! You're too sweet. Have a great Labor Day weekend! 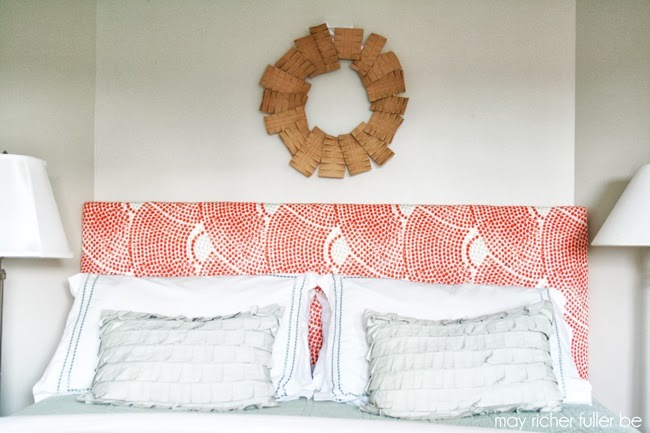 Your tutorial might be The Best DIY Headboard out there! I'll pin it and let my Facebook followers know. I like that you've used something lighter weight than plywood for the backing. I've been wanting to make an upholstered headboard and now I'm ready to tackle it. Thanks. Your articles make whole sense of every topic..
That looks really good. Quite frankly, I think your choice of fabric had a lot to do with the entire look. The circles in the pattern tend to give it that antique furniture look. 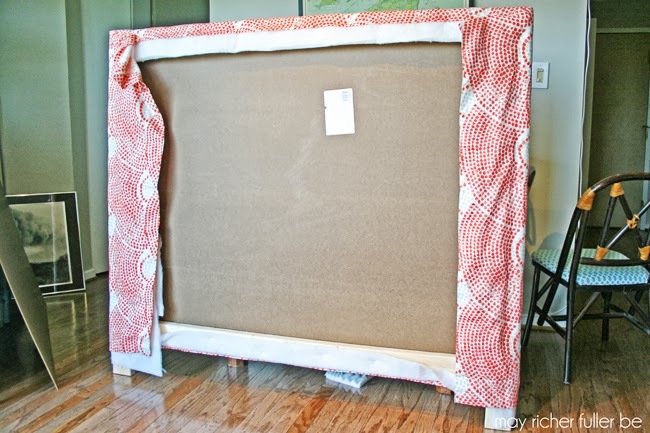 A lot of headboards have decorative swirls and circles in them and the fabric has that. what a creative. I love it! Hi, What is the Wall paint color in your bedroom? Do you have a lot of natural lighting?